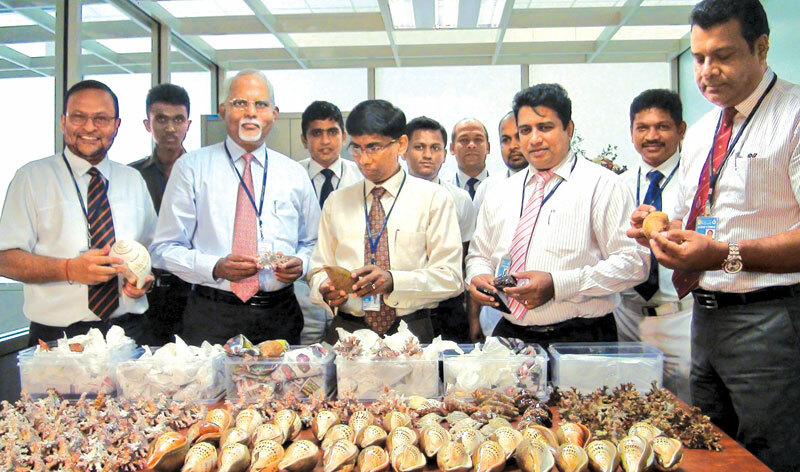 Customs officials at the Bandaranaike International Airport, Katunayake yesterday seized a haul of conch shells and other shells to be smuggled out of the country violating the Customs Ordinance, Fauna and Flora Ordinance and Fisheries and Aquatic Resources Act. Customs Department officials said an Indian national who arrived in the country for business purposes had bought these shells from persons in Hambantota and Tangalle.The suspect had told the Customs that he was planning to sell the shells back to Indian devotees for religious activities. Deputy Director of Customs Parakrama Basnayake said the haul of shells would be displayed at the museum of the Customs once the investigations are complete.